Fernando Alonso became the fourth winningest driver in Formula One history with his win in the Spanish Grand Prix Sunday, May 11. 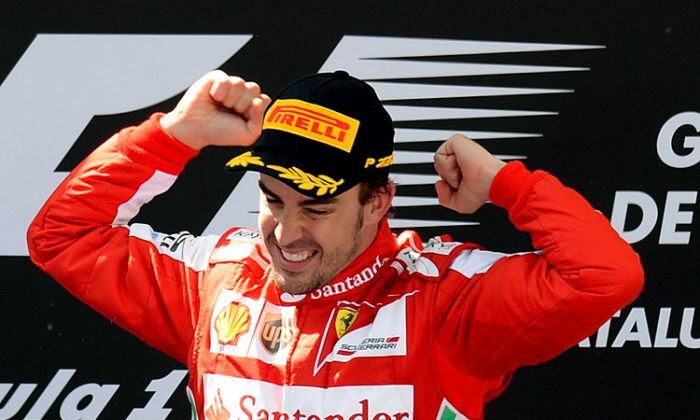 The Ferrari driver was also the first to win a dry race at Barcelona from further back on the grid than fourth. Alonso attacked right from the start, passing two cars in the first two corners and pushing hard throughout the race. He had the crowd cheering with every overtaking maneuver, and in the closing laps it seemed everyone in the grandstands were on their feet and cheering as it became clear the Spanish native would take the win. “It’s very special winning at home. It doesn’t matter how many times you can do it, how many you repeat it, it’s always like starting from zero and you have again very emotional last laps, very long last laps because you want to finish obviously as soon as possible,” Alonso told Formula1.com. “Extremely happy for the team to have both cars on the podium after a difficult qualifying that maybe we were not too fast yesterday. But we knew we had the pace on the long runs and we wanted to have some clear air to exploit this potential in the car. We did it. Everything worked perfect. Kimi Raikkonen scored yet another podium finish, coming home nine seconds behind Alonso. The fast Finn showed that the 2013 Lotus chassis is one of the best on the grid; while everyone else (except Alonso) were complaining of tire wear, Raikkonen finished the race with only three stops. Felipé Massa claimed the final spot on the podium after starting ninth—quite a performance from the Ferrari number two driver. Sebastian Vettel finished fourth, the best of the Red Bulls, 38 seconds behind the leader. Mark Webber brought the second Red Bull home fifth, ten seconds behind his teammate. Nico Rosberg and Lewis Hamilton qualified one–two for Mercedes, but knew before the race started that their chassis had severe rear tire wear issues and wouldn’t be able to push hard during the race. The Mercedes drivers opted for a three-stop strategy, hoping the slower pace would allow them to get the most out of the chassis without cooking the tires. Rosberg managed to finish sixth, and Hamilton a disappointing 12th, out of the points. Hamilton had to make four stops; his hard driving style hurt him. Alonso’s victory shook up the overall standing and constructor standings. Sebastian Vettel’s ten-point lead over Kimi Raikkonen was cut to four, while Alonso advanced to within 17 of the Red Bull driver. Lewis Hamilton in fourth is now 49 points down. Ferrari is second in the constructors’ championship, trailing Red Bull’s 131 points by only 14. Lotus is third with 111, and Mercedes in fourth has only 72. Alonso is confident the team will do well in Monte Carlo, even though overtaking on the Monaco street course is notoriously difficult, which would favor Mercedes, which has won the pole in three races running. “[Mercedes] will arrive as favorites for Monaco. They’ve been on pole position for the last three races … so it would be a surprise if they weren’t on pole position in Monaco. It’s more difficult to overtake in Monaco, so maybe they can keep good positions for longer. It’s something we need to understand and we need to do a better job on Saturday, Felipe and I, and Monaco is one of those places where we must do it. The two-time World Champion thinks 2013 is his best chance to win a third title. “We should have won the championship, I believe, in 2010,” he said in response to a reporter’s question. “We arrived in Abu Dhabi with seven points, or nine points ahead of Sebastian [Vettel]. “Last year maybe we didn’t deserve it because we were one second off the pace but even with that we managed to fight until the Brazil race. “This year we have in our hands a package that maybe is not the fastest, still not the fastest but we are working on that. But definitely on Sundays it’s a very competitive team package. We are not the quickest over one lap, maybe we don’t set the fastest time in the race but we have fantastic strategy people, fantastic pit stops, the starts, tire degradation. We have many ingredients to have a competitive car to fight for the championship. Both Fernando Alonso and his team mate Felipé Massa charged hard from the start. Sebastian Vettel also attacked immediately; he knew if he could get past the Mercedes of Nico Rosberg and Lewis Hamilton, he could drive away from the field in the classic Vettel-victory manner. Vettel got by Hamilton through the first turn, cutting across his nose and forcing him to lock up his brakes, then banging wheels with the Mercedes on the way by. Fernando Alonso attacked with more finesse and more effect; the Ferrari driver pushed past both Kimi Raikkonen and Lewis Hamilton through the first turn, and then went around Vettel on the outside through Turn Three. “The start was very good but then it was very narrow and we didn’t have the space to move a little bit, so I wait for a better opportunity.” Alonso explained. “It came straight after Turn One. Alonso pitted on lap ten, a brilliant tactical move, because the rest of the leaders pitted a lap later. Alonso drove a spectacular out-lap and passed pit-out before Vettel emerged, giving the Ferrari driver second place, half a second behind Rosberg. Two laps later the two-time world champion got around Rosberg to take the lead. Alonso pitted again on lap 21, taking a second set of the hard Prime tires. He rejoined third, but quickly set a fastest lap in his pursuit of Vettel and Raikkonen. A lap later Vettel also stopped for more hards. Alonso had not trouble passing Raikkonen, who was conserving his tires on a three-stop strategy. This put the Spanish driver into the lead again. Two laps later, both Massa and Vettel passed the Lotus, dropping Raikkonen to fourth. On the same lap, Vettel got a message from his pits telling him to watch his left front tire. Raikkonen, even on his old tires, was able to overtake Vettel on lap 33; the Red Bull driver fought him off once, but Raikkonen pushed hard into Turn One and got by. Three laps later Alonso pitted once again, giving Raikkonen the lead. Despite whatever issues, the unflappable Finn kept circulating according to plan. He came in for a set of Hard tires on lap 45, 21 from the finish. This dropped him to third behind Alonso and Massa but both Ferrari drivers needed another stop. “Slow and steady wins the race,” so the old adage goes, but Fernando Alonso gave it a new twist. Slow and steady comes second, he showed, while fast and steady can’t be beat. No lockups, no slides, just quick, smooth laps, let the lead Ferrari driver get more out his tires than any other driver. Alonso came in for his last set of tires, Mediums, sixteen laps from the finish, and rejoined still in the lead. Massa and Vettel soon came in and both took Hards for the final stint—16 laps being a lot to ask from Mediums, even on a light fuel load. A lot to ask for some drivers and some chassis, but well within the abilities of Alonso and the Ferrari. Alonso managed the gap to Raikkonen and won his home Grand Prix for the first time since 2006, and the first time in a Ferrari.